Fringed by the sea, with a landscape that is spectacularly varied, a golf vacation in Ireland is one you’ll never forget. Courses sweep across mountains and skirt seas, each one different from the next. Ireland possesses many of the finest golf courses in the world and is quite rightly one of the world’s premier golf destinations thanks to household names such as Ballybunion, Royal County Down, Royal Portrush, Lahinch and Portmarnock to name just a few. From the very many internationally renowned golf courses to the welcoming local clubs in every corner of the country, Ireland is a golfer’s paradise. There are more than 400 courses on the island including over 30% of the world’s links courses. From green parkland to rugged coastal links and everything in between, there is a course to suit every skill level from beginner to pro, and now more than ever before, every budget. The choice for golfers is simply staggering. 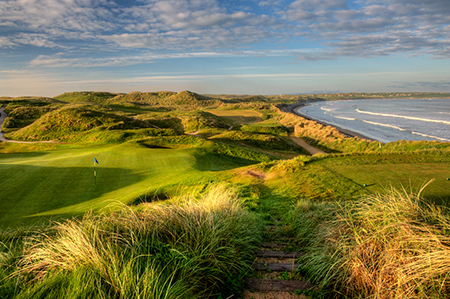 Truly, golf in Ireland is just too good to miss. The informal and friendly manner in which the game is played here, makes Irish golf a very special experience. Ireland - fabulous scenery, friendly people, great music, great shopping and suprisingly wonderful cuisine - an experience that will stay with you.